Sinclair Int’l has added many new products to its catalog, including recently-introduced reloading products from Hornady: AutoCharge electronic powder measure ($249.95), Lock-N-Load Concentricity Gauge ($99.95), and the Lock-N-Load UltraSonic Cleaning machine ($99.95). In addition, Sinclair has rolled out some impressive new products of its own, such as the new fully-adjustable, quick-attach Tactical/Varmint Bipod. With a hefty $229.95 MSRP, the new Sinclair Tactical/Varmint Bipod (item 04-8500) is nearly three times the price of a Harris bipod. Is it worth the extra money? For a typical varmint hunter, the answer might be no. But for the tactical competitor, the enhanced performance (and extra features) of the Sinclair tactical/varmint bipod may well be worth the extra coin. The new Sinclair Tactical/Varmint Bipod is a strong, rugged design with billet aluminum and stainless steel construction throughout. There are many enhanced features compared to a Harris. First, the Sinclair Bipod’s individually adjustable legs can spread much wider (and lower) than on a Harris. The legs adjust from 6 1/2 inches to 12 1/2 inches in length, and there is a positive stop on each leg. The Sinclair Bipod also comes with a built-in “Pod-Loc” style cant adjuster, a really important feature that must be retrofitted (for about $27) on a Harris. In addition to the cant adjustment lever, the Sinclair bipod has a secure quick-release attachment system — the same system used on Sinclair’s popular F-Class Bipod. This lets you install or remove the bipod in seconds without any tools. Showing attention to detail, Sinclair also included an extra swivel stud on the bipod upper section, so you can attach a sling. Overall, the new 1 lb., 12 oz. Sinclair Tactical Bipod looks like a very good product that offers real advantages over a Harris for the tactical shooter. We just wish the price was lower. Here’s the first look at Hornady’s brand new Lock-N-Load AutoCharge electronic powder scale/dispenser. This unit can measure up to 1000 grains of powder. According to Hornady, the unit will calculate weight precisely to within ± 0.1 grains. That would put it on a par with the RCBS Chargemaster, though the Hornady unit sells for $60-$80 less than the “green machine”. The Hornady has many nice features, such as an easily readable, back-lit display, trickle function, calibration weights suitable to both low and high powder charges, and plenty of memory for your favorite loads. The Hornady, priced at $249.95 (item 050068) at Sinclair, also features three, user-selectable dispensing speeds — something you won’t find on the RCBS ChargeMaster. Those three speed settings let you optimize dispensing flow for the type of powder you’re using. We hope to get one of these Hornady AutoCharge units soon and run a head-to-head comparison with our RCBS Chargemaster. 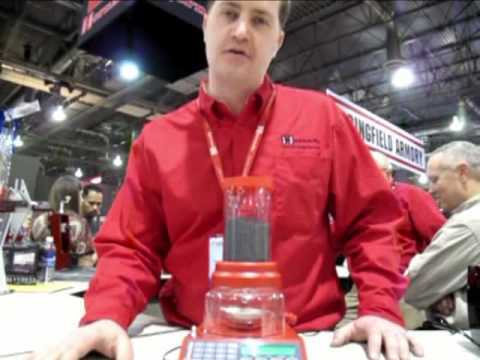 Below is a video from SHOT Show 2010 of an early production Hornady AutoCharge. Share the post "Sinclair Offers New Tactical Bipod and Hornady AutoCharge"
NRA Hires 'Tactical Coordinator' — Will Future High Power Matches Include Tactical Rifles? It looks like the NRA is considering creating a new type of multi-distance rifle match, or at least expanding High Power competition as we know it today. The NRA has seen the growing popularity of “tactical” matches with scoped bolt-action rifles, and apparently is looking for ways to bring the tactical game under the NRA umbrella. The NRA recently hired Trey Tuggle for the newly-created position of “Tactical Rifle Coordinator”. This position is part of the NRA Competition Division’s efforts to bring more people into the shooting sports. The focus of the Tactical Rifle Coordinator will be to promote the use of optics at existing High Power Matches as well as to move the NRA forward with a sanctioning process for Multi-Gun Action Shooting Events. As a former U.S. Navy SEAL sniper, Trey Tuggle knows his tactical rifles. Tuggle is also an entrepreneur, having created a counterterrorism assault vehicle company called Patriot 3. Those interested in tactical or multi-gun competition can email Tuggle via ttuggle [at] nrahq.org. Share the post "NRA Hires 'Tactical Coordinator' — Will Future High Power Matches Include Tactical Rifles?"